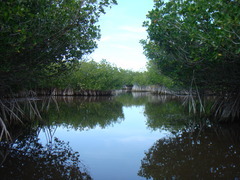 The freshwaters of the Big Cypress Swamp, essential to the health of the neighboring Everglades, support the rich marine estuaries along Florida’s southwest coast. Protecting over 720,000 acres of this vast swamp, Big Cypress National Preserve contains a mixture of tropical and temperate plant communities that are home to a diversity of wildlife, including the elusive Florida panther. Culturally, the Big Cypress Swamp has served as home and refuge to many people throughout time including the Miccosukee Tribe of Indians of Florida, the Seminole Tribe of Florida and early settlers. 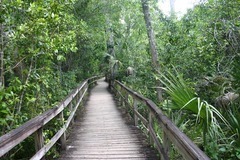 Soon after the Tamiaimi Trail was complete in 1928 the logging industry began within the Big Cypress Swamp. Many of the people that were involved in the activity were of African America descent. All plants and animals in the Preserve are protected from unauthorized collection. The Big Cypress National Preserve was created in 1974 to protect the water quality, natural resources, and ecological integrity of the Big Cypress Swamp. Among many topics, researchers from the NPS, the USGS, and universities work for Florida panther restoration, hydrologic enhancement, and understanding the effects of wildfire and prescribed burning on vegetation. Did You Know (Factoids about the Park)? The Great White Heron is very similar to the Great White Egret. However, look closely and you will see that the heron has yellow legs, while the egret has black legs. The Great White Heron is found only in South Florida in the United States. It can also be found on several Caribbean Islands. Taking the trees for logs! There are few “big cypress” in Big Cypress National Preserve. 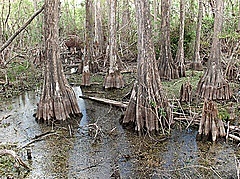 The name comes from the great expanse of cypress forest, hundreds of thousands of acres, within the Big Cypress Swamp. The anhinga is a commonly seen bird in many areas of Big Cypress National Preserve, and other park areas in Florida. However, within the United States of America, the bird is never really seen beyond Florida. Within Big Cypress HP Williams and Oasis Wildlife Viewing Platforms are popular areas to see alligators. The best time to see large congregations of alligators is typically from January through May. Remember not to feed or approach these dangerous animals.
. Please do not feed any of the wildlife within the Preserve. This bear was fed and eventually became a nuisance. Nuisance wildlife is sometimes removed, but typically does not survive. The purple galinule though one of the most colorful birds in Big Cypress, is often well camouflaged. Look carefully along canal edges and gator holes for this beautiful bird. Many of the surrounding colors blend well with the birds feathers. Feeding alligators creates nuisance alligators. Every year alligators that have been fed by visitors begin to lose their fear of humans. If these animals become aggresive they are killed to insure visitor safety. To avoid this tragic end for these unique animals DO NOT FEED THEM. I hope you enjoyed your visit to the perserve. Thanks to the National Parks service for all of the thumbnail wildlife photos and to Panramio for the beautiful park photos. Visit http://www.nps.gov/bicy/ for more perserve information. on October 20, 2009 at 10:03 PM | Reply Kathy A. Thanks. Loved it… and you knew that I would. I think that the statue provides a beautiful depiction of worship. Location signifies that we can worship our creator anytime, anywhere. Message- From the depths we can reach out to God. I knew you would like it! More sites are just up the road. Thanks Java. I am considering adding a video feed feature for future sites.